The daughter of Brian “Tubby” William Singleton DFC, Korean War hero who at the age of 20 was the youngest ever recipient of the DFC from the USA, it was a given that Sue Singleton would one day also get her wings. In 1987 she was send solo by Tubby and signed out by and Russel Donaldson and currently has logged 5200 hours. 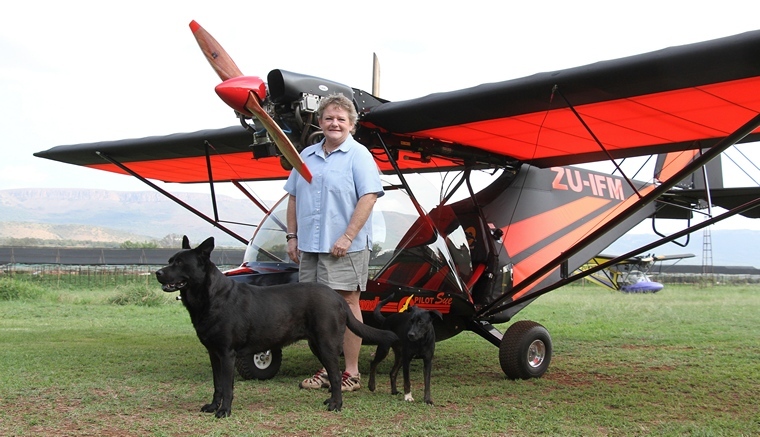 Sue, an instructor with 25 years' experience and the first woman in South Africa to qualify as a Microlight Instructor, is based at Hekpoort close to Hartbeespoort Dam and the owner of Valley Flight Microlightning. 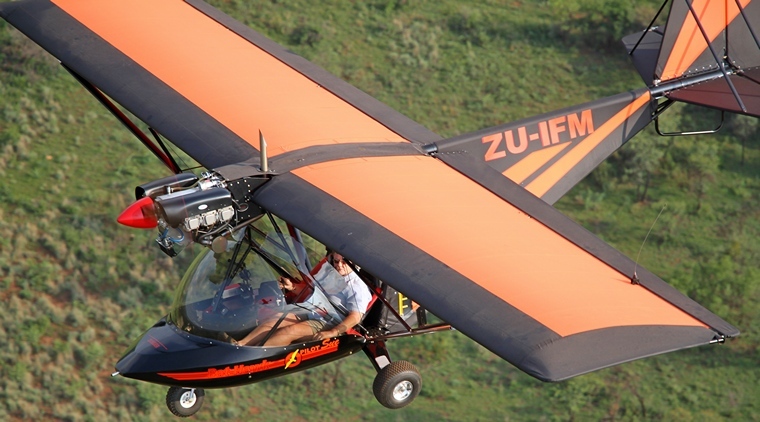 Valley Flight not only operate as a flight school (ATO: CAA OO80) but also offers early morning and late afternoon flips along the scenic Magaliesberg mountain range, soaring with the Vultures. Open Monday to Sunday from 5.30 am to 11am (incl public holidays) first flight departs at 6am. Second slot is at 7.15 am. 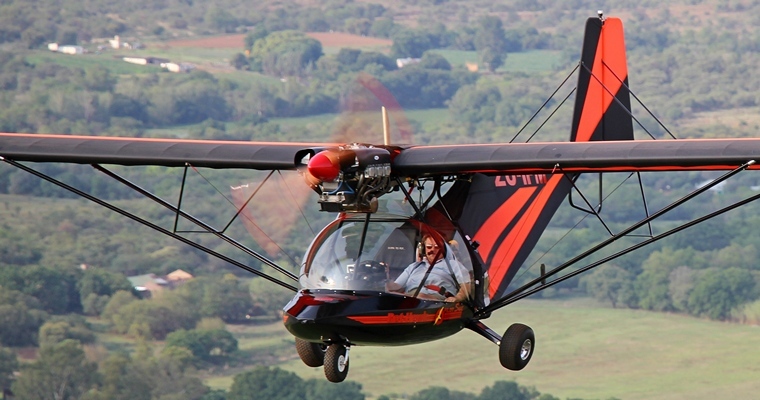 The current Valley Flights fleet consist of a Micro Aviation Bantam and Bat Hawk. Training takes place early in the mornings in the Bantam B22J or Bat Hawk, SA's most popular fixed wing light aircraft. Take is off from Hekpoort on a lush, long and wide grass runway with training at Rustenburg's nice long tar runway and the Magalies General Flying Training area with its calm weather characteristics perfect for microlight lessons. 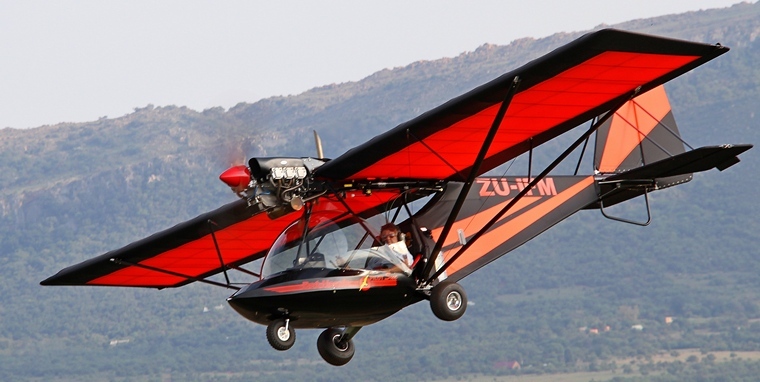 Sue said that she chose the Bat Hawk and Bantam because they are both fantastically safe aircraft with a very stable wing plan, perfectly suited for flying training, can handle a bit of weather and are the best value for money in their category. 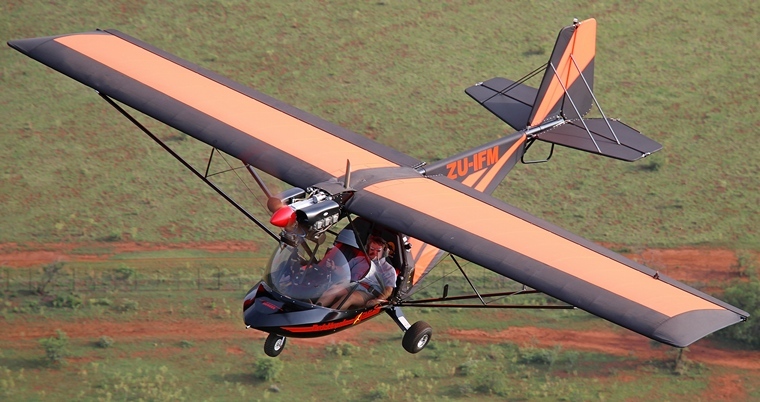 The Bat Hawk, that is supplied ready to fly, is a proudly South African LSA (Light Sport Aircraft) designed in Africa for African conditions and built by Nelspruit based Micro Aviation SA. Several important designs are incorporated into the Bat Hawk. Powered by a large six-cylinder Camit engine with substantial cheekplates and engine mountings it has an all up weight of 540 kg. Side by side seating with dual controls, comprehensive instrumentation and flying characteristics totally free of vices, make the Bat Hawk an ideal flight training aircraft. A true STOL (Short Take Off and Landing) aircraft the strong main gear, large 'bush' tyres and hydraulic disk brakes and high mounted propeller that reduces the risk of damage by grass, sticks, stones and sand makes the Bat Hawk a true Bush Plane. 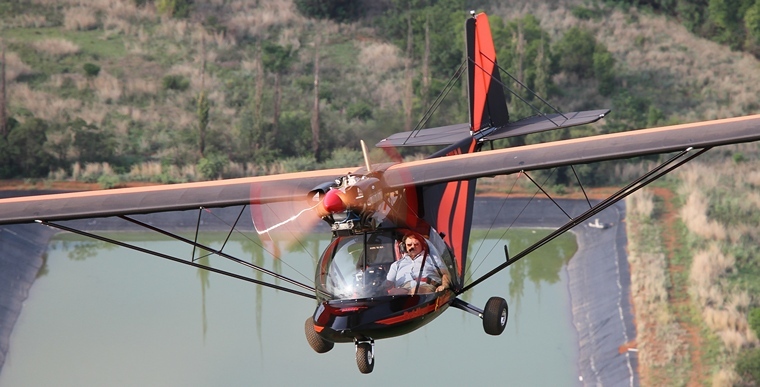 Its streamlined nose pod and a large windscreen and helicopter like visibility, large fuel tank capacity (80 liters), zip open / close luggage area and MGL Engine Monitoring System makes it a favourite in the surveillance and conservation industries. A Specialist Theatre and Veterinary Nurse Sue also has the distinction of having been only the second women professional guide to be accredited by the Botswana Government. For six years, during the 80's, Sue, who was then a professional photographer for Screen Media, and her Dad conducted photographic safaris from a mobile camp in the Savuti and Moremi areas. Sue's most memorable flight was a twenty hours solo ferry flight without ground crew. Flying a very tired Bantam from Addo Elephant Park back up to Nelspruit with a night stop, during which she slept in the aircraft, she returned to Addo with a brand new Super 6 Bantam. Whilst flying past the Maluti Mountains she almost froze to death and undoing her seat belt, got up and retrieved her sleeping bag from the luggage compartment. Once it was wrapped around her, she felt that she could survive the remainder of the flight. 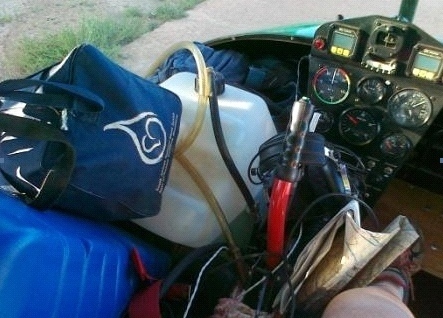 With lots of fuel on board including spare tanks on the seat and floor and equipped with electric spare fuel pump for siphoning fuel from the spare tanks to the main tanks she did one nonstop leg of seven hours. “I only stopped because I was almost out of fuel.” Sue recalled. A legend in her own lifetime in 1998 Sue received an Outstanding Achievement Award from the Aero Club of South Africa and in 2003 the Solo Wings First Lady of Microlighting Award. 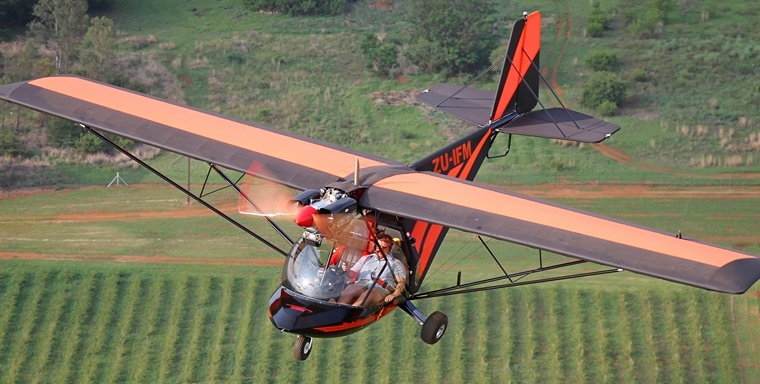 In 1998 she was only the second woman in South Africa to Qualify as an AP (Approved Person) and in 2004 she became the first and still only female in the country to qualify as microlight crop sprayer pilot. Flying, Sue said is her life, mother nature her love. 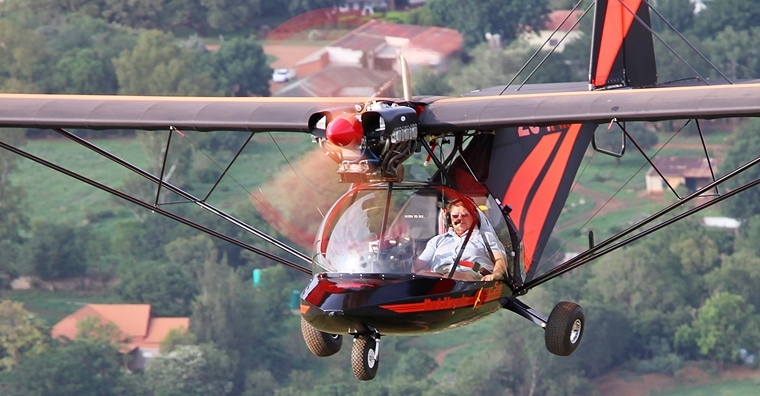 Many thanks to Pierre Bothma GRD 2/A Instructor and the CFI (Chief Flight Instructor) of Rustenburg Flying School who flew the Bantam as the camera ship for our early morning photo shoot.